I am not old enough to remember driving before Interstates, although I do recall as a child traveling with my family on two-lane roads, and not simply as an option to a faster route, but because the two-laners were the ONLY roads. The American interstate system was created in 1956, but not completed until 1992. Until then, most roads were two lanes. Driving was a lot more fun before the interstates, on the slower highways that preceded them. They went right through downtowns and main streets, tempting you to pause occasionally when you spotted a particularly nice looking giant root beer mug atop a roadside stand — a good indicator that the beverage served inside was tasty and cold. I also remember as a child seeing many war surplus airplanes permanently affixed atop gas stations like they had crashed there. Almost every main street had at least one small town cafe, where the locals hung out and where the waitresses were gum-chewing ladies named Betty who called you “Hon.” This was before McDonald’s, Burger King and the rest of the fast food joints ran these little guys out of business. Most of the old two-laners still exist. Some RVers, myself included, prefer to travel these roads. Interstates are good if you like getting somewhere fast or if you enjoy the sport in which 18-wheeler trucks try to pin you between them so you can choke on their fumes and, in the case of an accident, become immortalized by ending your life as a human sandwich. 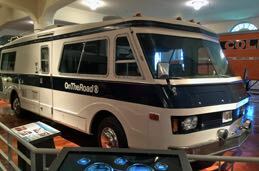 Charles Kuralt’s motorhome on display at the Henry Ford Museum in Dearborn, Michigan. The late CBS-TV “on the road” correspondent Charles Kuralt once said of our Interstates — and he has been quoted countless times since — that “Thanks to the Interstate Highway System, it is now possible to travel across the country from coast to coast without seeing anything.” I, for one, miss Charles. Today, driving an Interstate highway is a great way to view a never-ending parade of franchised food joints and cookie-cutter motels, now called motor inns and motor lodges. 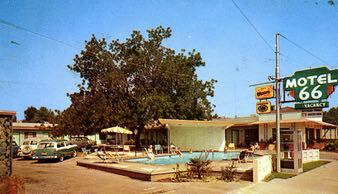 Motels that were called motels were better. The good ones had a swimming pool right out front in the middle of the parking lot instead of like today when they are squeezed into a fancy-shmancy courtyard or indoors where the experience is boring (unless you’re a kid, when a pool is a pool is a pool). I am actually old enough to remember Motel 6’s when they cost six bucks. I bet there are many people today younger than 40 who don’t even realize how the company got its name. The best buy ever in American roadside travel in the good ol’ motel days was the fabulous Magic Fingers “vibrating bed” machine where for 25 cents you could shake your bed and yourself up real good in what amounted to a poor man’s massage. I once hot-wired a Magic Fingers machine in North Carolina, back when I was so poor that saving a quarter was important because it would buy a gallon of gas. But I warn you: Never, ever spend more than 15 minutes on a Magic Fingers vibrating bed unless you’re into motion sickness. When is the last time you used a Magic Fingers machine? Do you remember? Did you ever have a memorable experience with a Magic Fingers machine? Please leave a comment. • Cocktails delivered by drone, not waiters. 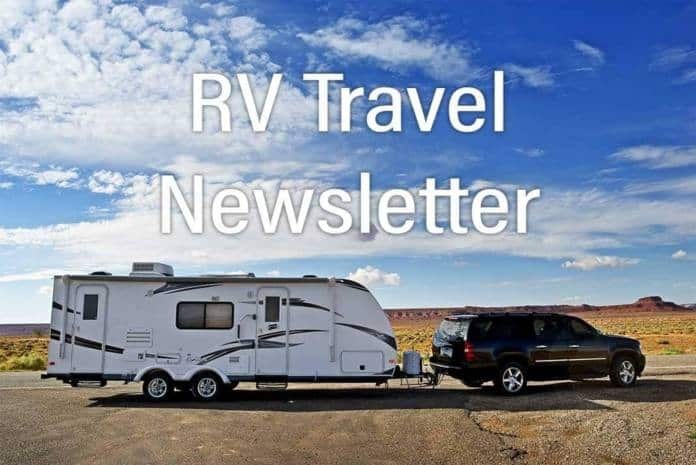 If you’d like to receive daily updates (most days) of new articles we post to RVtravel.com, please sign up here. You’ll receive an email update of what we published in the past 24 hours. 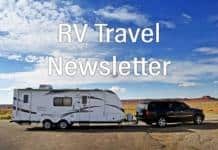 • Did you miss last week’s RV Travel? Read it here. • Directory of back issues. • Did you miss the most recent Great RV Accessories Newsletter? You can read it here. For more than 16 years, our staff has worked hard to bring you a valuable newsletter every Saturday. Readers help make it possible with their voluntary subscriptions. A pledge of $10 a year is less than 20 cents an issue! Your contributions make it possible for us to write about important matters, not just fluff to make advertisers and RV industry big shots happy. Enter a voluntary subscription. Use a credit card, PayPal or mail a check. We have a winner! No more entries, please. The correct answer is: Magic Fingers (vibrating bed). Win this cool Rechargeable Portable Mini USB fan. The winner will be chosen randomly out of all correct entries received by noon (Pacific), Sunday. The question: In his essay today, our editor writes about a machine at motels of yesteryear that would literally “shake you up.” What was it called? Email your answer to RVcontests (at) gmail.com. We can only ship prizes to addresses with a U.S. Zip Code. Only one entry per household. All entries must include your mailing address and telephone number (only used for mailing if you win) or your entry will be disqualified and we’ll choose the next (correct) entry. Contest ends Sunday at noon (Pacific), at which time a winner will be selected by Random.org. We’ll let you know if you win. Folks — Please remember to include your address and phone number or your entry is disqualified. Last week the winning entry number picked by Random.org had just the answer and their name, and the next entry didn’t have their phone number, so they both missed out on a swell prize. A Waterless RV Wash & Wax! Spit Shine has more emulsifiers than other waterless washes. It traps and lifts dirt to leave a clean, scratch-free, glossy surface. Great for when you’re on the go and don’t have access to a water hose. Requires just a damp, and a dry, towel. Watch Wade clean all RV surfaces. Click here to buy, or learn more about, Spit Shine at the Wade Maid website. Up and down — that’s the word on used RV auction statistics from June, according to Black Book. Compared to June 2016, motorhomes saw a price increase of 3 percent to an average $41,494, while sales volumes dumped 14 percent. Towables likewise saw price increases, up nearly 8 percent to $12,780, while at the same time losing sales to the tune of more than 10 percent. The service suggests the decline in sales is normal for this time of year, while increased sale prices might be attributed to a smaller volume of desirable units. Psst! That motorhome on the Iowa highway next to you might not be loaded with RVers — Troopers are on the highway in disguise. A new state law allows police to cite texting drivers but, alas, it seems most people simply hide their phones when they see a patrol car. So now, plainclothes troopers have taken to the highways in an “unmarked” motorhome, peeping at scofflaws to give them their just desserts. Will oil and gas drilling rigs come to Ohio state parks? It appears the matter is in the hands of Ohio’s state senate. The state’s governor vetoed a provision in a budget bill that would have essentially allowed it. The state’s House overrode the veto. If senators follow suit, it could be possible that oil and gas leases will be granted in state parks. The gates to paradise will be closed again. In this case, Paradise Campground in Montana’s Selway-Bitterroot Wilderness will be inaccessible from August 7 through 19, as the Forest Service replaces a culvert and Selway River Road to the campground will be shut down. The Forest Service has reopened the campground at Oregon’s popular Cultus Lake. The campground and associated day-use area and boat ramp were closed earlier this year due to discovery of hazard trees. At that time, the agency said the area would be closed for the season, but the resulting furor from users brought the attention of a local lawmaker. Somehow the agency was able to use a contractor to remove 500 hazardous trees in short order. Missouri State Fair officials say they’re not going to be on the hot seat again. Last year, in an embarrassing situation, some RVers who wanted to camp out at the fair spent up to seven hours parked on a hot asphalt lot while waiting to access their spots. The fair’s director said they just weren’t ready last year: In 2015, 400 RVs stayed at the fair; in 2016 some 1,200 showed up the first day. This year new tricks are in place to make it faster to get the rigs in the gates — pre-registration and portable credit card machines are two of the methods. And if more folks than the 1,100 full-hookup sites will accommodate show up, a large dry camp area is ready. Apparently, some Americans have heard about the massive price hike on senior’s lifetime recreation passes to National Parks and Federal Recreational Lands. Come August 28, what’s now a $10 charge will skyrocket to $80. At California’s Cleveland National Forest, officials say they normally sell about 200 passes per year. With the congressionally mandated hike announced, they’ve sold a thousand so far this year. Ray and Wilma Yoder, an 80-year-old couple from Indiana, have been to 644 of the 645 Cracker Barrel locations in the U.S., traveling more than 5 million miles in the process. This began 40 years ago as a dining preference for Ray, whose job sent him across the country delivering RVs for Coachmen RV. Ray told the Lebanon Democrat, “It took the boredom out of being on the road. It has a down-home spirit, and everybody is friendly.” The one elusive location is in Tualatin, Ore., which they might visit this year. A Plymouth Township, Mich., supervisor watched as his plans to criminalize RV parking went up in smoke. Kurt Heise moved to fine RV users $500 and send them to jail for up to 90 days if they parked on a public street or right-of-way. Fellow board members took a dim view of Heise’s “overkill” proposal and thumbed it down. Time to leave work behind — take the family and relax around a campfire this Labor Day weekend! Make lasting memories at your favorite RV Resorts. Book your Holiday weekend today, sites are filling fast! Click here to reserve your stay today! Heading to Yellowstone National Park? Expect to see a bit of smoke. The 2,000-acre “June Fire” will make its presence known until at least the end of September. The fire is outside the park in the Shoshone National Forest — 13 miles east. Firefighters don’t figure they can get the blaze out — they’ll just be happy to contain it, and away from infrastructure and homes. The most visible effect on the National Park is a squad of flying “Super Scoopers” gathering water from Yellowstone Lake to combat the wildfire. In Tennessee you can drink beer and support your state parks at the same time. Just belly up to the bar and call for “State Park Blonde Ale,” and a portion of every beer sale goes to the Tennessee State Parks Conservancy, a nonprofit group that supports the state’s parks. This craft beer is described as a “light, crisp American blonde session ale with subtle floral notes, created with high-quality grains and hops.” It’s brewed by a Tennessee brewery. You can’t miss it — on the label is the image of Randy Hedgepath, a ranger naturalist in the state park system for more than three decades. Rock Island County, Ill., has a bit of a problem. The County Forest Preserve Commission needs nearly $2 million to repair a dam and spillway on the preserve’s Lake George. Like a lot of government agencies, where you gonna find the money? Floating a bond issue is typical, but bonds have to be paid for. So, tack on another $3 million to add a new 53-site RV campground and a few cabins — and use the rent to pay for the bonds. It’s an idea the commission is presently giving serious thought to. With membership in Harvest Hosts® you can stay overnight at more than 570 wineries, farms and attractions across North America. Harvest Hosts offers an exciting alternative to traditional overnight stops where you can meet interesting people and learn about their lifestyle. Learn more at the Harvest Hosts website, or watch a video interview with the founders by RVtravel.com editor Chuck Woodbury. Driving a tow truck is never a dull moment — at least not in the life of one tow truck driver near Kerrville, Texas. The dispatcher sent the driver to tow a motorhome away after it had been involved in a fire. Dragging the big Class A unit down the road, he spotted smoke billowing out of the coach. More firefighters responded and took action again. State park honchos in Indiana are unanimous: No drones over Department of Natural Resources (DNR) properties, including state parks. DNR commissioners felt they were taking a proactive stance with the ban. Still, in a seeming contradiction, the agency is also examining how it might issue licenses to drone users to fly over its properties. A Cripple Creek, Colo., RV park tenant says he was up the creek in sewage, thanks to his landlord. Frank Wilson complained to a local TV station that as he was attempting to hook up his RV to dump his black water, the park manager of Lost Burrow Campground told him he’d have to wait until after the weekend. “You should’ve done it two days ago,” Wilson relates the words of the manager. Frank said this led to a rather unpleasant collection of human waste inside his trailer. The TV station was unable to secure a comment from the campground manager; the county health board was closed for the weekend. The Houston SPCA Wildlife Center of Texas is rehabilitating a 7-week-old ring-tailed cat that hitched a 200-mile ride to Houston clinging to the underside of an RV. Ring-tailed cats are members of the raccoon family and are known for their unusual sound, often compared to a typewriter. The Wildlife Center plans to return it to its natural habitat after rehab. It’s enough to make tenters take up RVing: A woman in a sleeping bag woke up with a start — and her foot in a bear’s mouth. The incident has caused Idaho’s Department of Fish and Game to shut down camping along FR 146 and 452 in the Sawtooth National Forest — including Caribou and Murdock campgrounds. The bear was spotted one day and chased away, but returned the next to put the clamp on the woman’s foot. She was not physically injured, but her sleeping bag did take a hit of bruin saliva. How many RVs have you owned in your lifetime? Which cellular service do you use? Here, as edited by Russ and Tiña De Maris, are some recent comments from our readers regarding: campground site shortage, campground privatization, credit card skimming scammers, readers with reservations about park reservations, and more. Read more. None of us like having something break down on our rig — but, hey, it’s reality. Breakdowns happen, and they’re worse when we’re away from home. Sometimes you’re stuck and have to get help from strangers – and sometimes you can do a “workaround” until you can get back to home base. Here’s how one reader used his noodle to do a workaround and continue his trip. File his solution away for future reference – you might need it yourself. Learn more. If you plan to visit Yellowstone National Park, here are some quick tips from rangers to help ensure your trip is safe and enjoyable. Watch the one-minute video. Chris Dougherty, certified RV technician, wrote this article while he was serving as RVtravel.com’s technical editor. A reader had heard about RVs getting fried by bad wiring in campgrounds, and asked if Chris would recommend purchasing a surge protector for an RV to help prevent this. Read Chris’ response. A lifestyle of simple luxury! At Guy Harvey Outpost Club & Resort Tarpon Springs, return to a lifestyle of simple luxury. Park yourself on 66 acres of unspoiled wilderness along Central Florida’s Gulf Coast. Our fully equipped RV lots and coastal cottages designed exclusively for the resort come with boundless modern amenities for the watersport and outdoor adventure enthusiast, all professionally managed by Guy Harvey Outpost Collection. Learn more here. The RV Safety and Education Foundation will hold its annual educational conference Oct. 1–5 in Elizabethtown, Kentucky. The event provides a positive networking opportunity for both new and veteran RVers with industry experts in classroom, roundtable and individual settings. Endorsed by RVtravel.com. Learn more or watch a two-minute video about the event. Most RVers have heard of boondocking and know what it is about, but surveys indicate that only a small percentage of RVers actually boondock other than an occasional night or two in a Walmart parking lot or a state park campground. Here are some logical and progressive steps to become comfortable boondocking in remote, pristine, solitary and wonderfully isolated private campsites — with no neighbors except for the nighttime coyote serenade and a sky full of the undiminished Milky Way stars. Learn more. Even the simple things: Quick-release rings have many uses! Most of us have a key ring. You know, the kind that bites your nails off when you try to put a key on or take one off. Rich “The Wanderman” found a great deal on a 10-pack of quick-release rings and has discovered a whole bunch of other uses besides just keys for these little beauties. Can you come up with some additional uses? Read more. Recognizing that U.S. National Parks are in need of an injection of cash to handle deferred maintenance backlogs, Ryan Zinke, U.S. Secretary of the Interior, recently announced funding to help cover the backlogs. A total of $53 million is headed to 29 states, to handle needs in 42 of America’s parks. How does this compare to what the National Park Service says is needed? Find out here. • Mr. Fix-It — Are you a DIYer? • Dutch company Epsilon solves RV battery limitations. • Coming soon: Reservations required to visit a National Park? • Full-time RVing — What about your driver’s license? See, compare and shop over 1300 new RVs from virtually every major manufacturer! Visit hundreds of vendors including campgrounds, accessories and services. Attend seminars covering subjects for the beginner to the seasoned RV enthusiast. Location is Hershey, PA. For more information, click here. While driving around the country in your RV, here are some attractions along America’s many iconic stretches of roadway, including Interstates 40, 95, 80, 10, and 90 and Route 66. Most are cheap or free; the others may be worth a splurge. From Cheapism and msn.com. “Traveling in an RV means a homey and budget-friendly vacation. Many campgrounds charge no more than $50 a night, and many offer resort-like amenities. Cheapism.com combed through TripAdvisor, RV Park Reviews, and campgrounds’ own review pages to find under-the-radar destinations in every state that may offer last-minute availability in high season. Discounts for seniors, military, and Good Sam RV Club members are common, as are extra fees for more than two adults and children.” From Cheapism.com and msn.com. Here is our “master list” of more than 700 websites we like. Regular unleaded gasoline: $2.31 (on July 24). Change from week before: Up 3 cents; Change from year before: Up 13 cents. Diesel: $2.51 (on July 24). Change from week before: Up 2 cents; Change from year before: Up 13 cents. Repel 100 uses a 98.1-percent DEET formula to provide complete protection from mosquitoes, ticks, gnats, chiggers, no-see-ums & biting flies. Use in areas of high infestation or prolonged periods of up to 10 hours. Repels mosquitoes that may transmit Zika and other viruses. Learn more or order. Never take a wrong exit off an Interstate highway again. The 2017 Next Exit lists every exit along every Interstate and details exactly what you will find at each: gas stations (including if they offer diesel), campgrounds, truck stops, casinos, laundries, retail stores (by name), shopping malls, factory outlet malls, drug stores, hospitals, rest areas & more. Very helpful even if you have a GPS. Learn more or order. Our favorite products for RVers at Amazon.com. Check ’em out. Check your safety chains to prevent fires! Pay particular attention to the length of the safety chains connected to a towed trailer or vehicle. They must be long enough to allow a full turn without binding, but short enough to not hit the ground. Wild fires along the highway have been traced to dangling safety chains causing sparks and igniting dry grass and tinder. Thanks to Fred Campbell for the reminder. From reader Joe Brignolo: “If you have a battery shutoff switch, as I do, make sure that switch is ON. More than once I have started the troubleshooting process only to find that switch in the OFF position. Inadvertent operation of that switch when looking for the compartment lights could leave you in the dark.” Thanks, Joe! Tom Buchholzer took in our video clip on air conditioner maintenance. He adds a tip not to be missed: “I had a leak which stained the ceiling of my RV because the drain holes in the air conditioner pan were plugged. It is VERY important to be sure that the drains are clear and open while servicing the unit.” Good reminder, Tom! Easy way to add water to your batteries! Never, ever, let your automotive or RV deep cycle batteries run out of water. Here’s a simple way to keep them topped off for maximum performance and long life. Just use this syringe with distilled water. So easy. Learn more or order. If you drive a big rig with a car in tow, you might want to alert some distracted drivers around you to the size of your rig, and your limited turning radius and stopping ability. There is no better way than with an audio broadcast system that will be easily heard by those around you. But if that doesn’t work, the LAMPHUS SoundAlert Series’ feature-packed warning system also includes a very audible 100W siren guaranteed to get attention and be heard from a distance away. Learn more. Send us a photo of your RV (and tow vehicle) with a 150-200 word description of where and how often you travel with it, and what you like or don’t like about it. Include your name(s) and hometown. We’ll post them to RVtravel.com. Send to managing editor Diane McGovern at Diane (at) RVtravel.com . CLICK HERE to see last week’s RV Travel Reader RVs. I was told that it is best to drain your hot water tank after each excursion; therefore, I replaced the anode with a petcock. I now drain the water out but am curious as to the soundness of this plumbing exchange. Any advice would be appreciated. —Gary G.
Read the most recent BoondockBob Blog post: Affordable long-term living ideas for RVers and tiny house dwellers. More than 12,000 Amazon customers have given this Black and Decker CHV1410L cordless hand vacuum an excellent rating. It boasts lithium technology, strong suction and fade-free power. With a translucent bagless dirt bowl, the dirt is easy to see and empty. Ever-ready, the hand vac can hold a charge for up to 18 months. Perfect for the RV! Learn more or order. Replacing tungsten and halogen bulbs with modern LED bulbs is becoming popular with many RV owners since it reduces the power load. However, you have to be careful that you’re installing LED replacement bulbs into DC-powered fixtures, and NOT AC-powered fixtures. Recently, editor Chuck Woodbury has received letters from RVtravel.com readers about replacement LED bulbs overheating and melting the fixtures. Read why, and how to avoid this potentially dangerous situation in this article. Camco’s Pro-Strength Black Streak Remover is a specially formulated cleaner & degreaser that removes stubborn black streaks caused by window & door sealants & roof coatings. Also powers through bugs & built-up tar, grease, oil & dirt, helping to restore a like-new appearance. 32-ounces. Learn more or order. Read your RVer horoscope for August. After sitting 5 years, does trailer need new tires before a long trip? Read the rest of the question and Roger’s response. This recipe is for people who love shrimp so much they can make an entire meal of them. You can shell and de-vein them yourself after a good catch, or buy them frozen, but this is not a peel-and-eat meal. The shrimp are too deliciously saucy and buttery to handle. Spear them with a fork and add chunks of crusty bread for sopping up the delectable sauce. It’s the simplest of all dishes to serve as an appetizer or main course. Get the recipe. Those of us who travel by RV have the enviable opportunity to be in the perfect spot for the historic total solar eclipse that crosses the United States on August 21, 2017. But how do you find that perfect spot? With an app on your smartphone, of course! Learn more in this article from Chris Guld of Geeks on Tour. … from Geeks On Tour. Here are two recent webcasts: #120 Beginners’ questions about smartphones and #119 Photo albums with Google Photos. Watch live or archives of past programs. • Van Buren State Park is located in northwestern Ohio about 7 miles north of Findlay. • Popular TV chef Guy Fieri takes his family with him on a cross-country food adventure on Guy’s Family Road Trip. • Warwick Conservation Area is located in southern Ontario near the town of Warwick. Add an outdoor water faucet to your RV! This lead-free outdoor faucet is really handy. If you don’t have one, here’s a super inexpensive way to add one. No tools required and it installs in a minute (just screw it on). Brass T included with the plastic faucet, just as it’s shown in the product photo. Learn more or order. FREE. Info provided by AR DOT & Welcome Center confirms reports that overnight RV Parking is allowed, with a maximum stay of 24 hours. Located at 6717 Highway 67. Chris Dougherty has good advice. Watch the video. RV Travel editor Chuck Woodbury shows an easy way to make your photos better. Watch the video. Most RVers rely on battery-powered devices while on the road, whether flashlights, radios or cameras. But sometimes you just can’t tell how much life a battery has remaining so you toss it to “be sure.” This small tester, for about $8, will alert you in an instant to the condition of your batteries, saving you money from needlessly tossing ones with plenty of life left! Works on AA, AAA, C, D and 9V and button-type batteries. Learn more or order. 1492 — Columbus sets sail from Spain. 1949 — NBA is born. 1958 — President Eisenhower authorizes creation of NASA. 1958 — U.S. nuclear submarine Nautilus travels under North Pole. 1961 — Six Flags Over Texas opens. 1965 — President Johnson signs Medicare into law. 2003 — Last classic VW Beetle rolls off the line. Here’s a bumper sticker on a car with Wisconsin license plates seen in Kalispell, Montana: “If you truly love someone, give them cheese.” Thanks to John Jamieson. This one’s still floating around: Seen recently on the back of an All About Plumbing of Orlando truck in Florida: “Where a flush beats a full house.” Thanks to Jann Brodrick for sending this. With this Dometic LPGC10 LP Gas Checker you can instantly monitor your LP tank’s level. It uses ultrasonic technology to tell you in just a few seconds how full – or empty – a propane tank is. It’s about the size of a writing pen and weighs less than two ounces, so it’s easy to store. For use on steel and aluminum liquid propane tanks. Learn more or order. At home when you run out of something that you need for dinner, you make a fast trip to the supermarket. But when you are camping far from a store, there is nowhere to go. And thus begins a process of going through the cupboards or fridge to try to find what can be used as a substitute. More often than not, something is found and the meal is a success. Actually, this process can be very creative and adds a bit of a challenge to getting by while on the road. Previous articleHow many RVs have you owned in your lifetime? Traveled Rte. 66 back in 1966 from one end of continent Binghamton, NY to Calif. and yes, did use the magic fingers. Delightful! 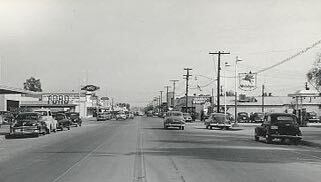 Traveled route 66 back in ’62 and enjoyed the small towns and interesting places to stop. When we were kids, mom and dad stopped at the Howard Johnson’s motels and of course remember the Burma Shave signs. Had seen the magic fingers, but never used them. A quarter was a lot of money back then. Thanks for the memories! We would rather travel the blue roads rather than the interstates any day! I still love the back roads. Been border to border and coast to coast more than once. Interstates are fine but the backroads are still the best. Keep up the good work Chuck. As for Magic Fingers, my parents were very thrifty so once in a great while, we were allowed to put a quarter into the Magic Fingers machine, but then we had to unplug it and save the rest for the next day, which we did. Magic Fingers for the whole weekend on one quarter. The answer to this week’s contest is the Magic Fingers machine at motels which cost one quarter per use. Hi Carl, I feel fortunate to have found a similar story and did not waste any time inspecting my tt for issues like you have mentioned. No axle pins missing and everything in good order. But it is terrible that there are folks out there suffering financial and possibly physical damages due to poor workmanship. For those that would like more information, try searching YouTube or Google. I got my info from “Keep your daydream” on YouTube. Don’t trust the manufacturers; read, watch videos, and learn, then prevention is possible. Ah….Magic Fingers ….. the Original Quarter slot machine…..Put many coins into those gismos….. Your article mentioning Magic “Fingers and bypassing the payment brought back a memory. in about 1975 we were going across country from Washington to Maine. We stopped at a small motel in South Dakota which had the Magic Fingers. I discovered that the money box for the device could be unplugged and you were left with a short electric cord which by moving the bed you could just barely reach an outlet and plug it in. After a full day of driving it gave great satisfaction to get this “free” massage. Loved your story about the old two lane roads! Brought back lots of great memories. My sister and I wanted to try the magic fingers vibrating bed. My dad gave us a quarter and said we could only use it until the quarter ran out then it was time to sleep. We put in the quarter and……nothing. So my very smart sister crawled under the bed and noticed it was unplugged. She plugged it back in. Evidently, no other motel patron had been intelligent enough to check the plug. So we vibrated happily for hours! My dad was not amused! That joke of the week is the best one I’ve heard in a long, long time.